When it comes to fine tuning the comfort of your home environment, Adams Heating and Cooling are the experts in Kalamazoo, MI. Whether it’s zone damper installation or the purchars of a new programmable thermostats, call Adams to improve your home environment. Dampers are good for anyone with forced air heating and cooling that has uneven heat or cooling problems, and wants total comfort. A zone damper is a specific type of damper used to control the flow of air in an HVAC heating or cooling system. In order to improve efficiency and occupant comfort, HVAC systems are commonly divided up into multiple zones. For example, in a house, the main floor may be served by one heating zone while the upstairs bedrooms are served by another. In this way, the heat can be directed principally to the main floor during the day and principally to the bedrooms at night, allowing the unoccupied areas to cool down. What is the advantage of programmable thermostats? 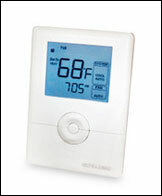 Thermostats are installed in rooms or various floors to control particular areas heating and cooling. A programmable thermostat allows you to change the temperature at different times of the day. For instance, if you like it cooler at night, you can set the thermostat to a cooler temperature at night and a warmer temperature in the morning. You can also set a different temperature schedule for specific days of the week. While no maintenance is needed for zone dampers or programmable thermostats, the damper system has red and green indicator lights to show if dampers are opened or closed allowing home owners to know if system is working properly. Adams Heating and Cooling sell all zone damper models in the EWC Controls brand.